An exhaustive plant-by-plant study reveals the toxic impacts of producing chlorine for PVC, polyurethane, epoxy, and polycarbonate. Mercury, asbestos, and PFAS are all a problem when producing chlorine for PVC and other plastics, a new report says. Chlorine is a problem. Used in many industrial processes, including the production of PVC and other plastics, it readily combines with other compounds to form persistent, bioaccumulative toxic chemicals (PBTs). These chemicals are not only toxic but also highly mobile in the environment and don’t break down readily. The green building community has looked askance at PVC for decades because of the plastic’s significant chlorine content and the associated pollution (see The PVC Debate: A Fresh Look). Now a new report from the Healthy Building Network adds more details, showing that many chlorine-producing plants also contaminate the environment with mercury and per- and polyfluoroalkyl substances, while others put miners and other workers at risk by using asbestos. The chlorine from these facilities is used not only in PVC but also in the production of polyurethane, epoxy, and polycarbonate. 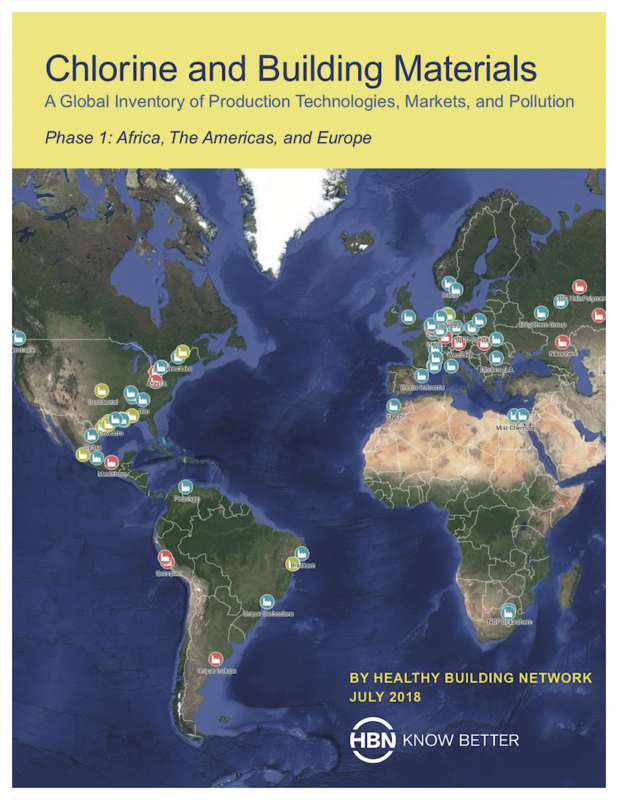 The report, Chlorine and Building Materials: A Global Inventory of Production Technologies, Markets, and Pollution, provides a factory-by-factory profile of chlor-alkali production plants in the Americas, Europe, and Africa (a planned phase two of the project will cover Asia). Funded in part by Carnegie, Designtex, Interface, Humanscale, Interface, Metroflor/Halstead, and Tarkett, the research is designed to help manufacturers manage their supply chains by highlighting the worst polluters. “We funded this report because we support transparency in the PVC supply chain and hope this is the start to more collaboration with the Healthy Building Network to improving the PVC supply chain,” said Interface in a statement provided to BuildingGreen. The company manufactures carpet, some of which includes PVC backing, as well as luxury vinyl tile. But there’s a big takeaway for building professionals as well, according to Jim Vallette, research director at the Healthy Building Network and the author of the report. Is all chlorine the same? How is this chlorine different than the chlorine we put in our drinking water and swimming pools? Or chlorine bleach? It would be nice to get some context between what goes in our building materials and other uses. re: Is all chlorine the same? Great question. Chlorine-based products are made from highly toxic chlorine gas -- the same gas used in chemical weapons. A very small percentage of that gas, approximately 6%, is manufactured into less hazardous water treatment formulas that are commonly, but imprecisely called "chlorine." Over 90% of chlorine (gas) is used in product manufacturing, mostly for plastics, as more and more chlorine-based chemical formulas get phased-out due to environmental health hazards (think DDT, PCBs, CFC, methylene chloride, and pulp & paper bleaching.) PVC/vinyl stands out as the largest use of chlorine (gas) among the plastics, and building products are the largest use sector for PVC and the other plastics. Our research also found that over 400 tons of chlorine gas are released per year by chlor-alkali facilities in the US and Canada. Let us know if you have further questions or need more information!